We are very excited to be introducing The Dark Horse of Saratoga Springs! This new brand and image is one that we have been working on for some time now. Before we show you all of the new and exciting things we plan on doing with The Dark Horse I wanted to share with you the history behind it and where the name comes from. As many of you know Saratoga Springs is home to the oldest thoroughbred racecourse in America. 2013 celebrated the 150th year of our grand old track. Though trainers, owners, and riders dream of winning in Saratoga the track has earned the name "The Graveyard of Champions". Saratoga Springs is where The Dark Horse thrives. The term The Dark Horse refers to someone who prevails though he was previously unknown. Through some research we have found that the writer Benjamin Disraeli was the first to use this term (as far as we know) in his 1831 novel The Young Duke. Disraeli writes "The first favourite was never heard of, the second favourite was never seen after the distance post, all the ten-to-oners were in the rear, and a dark horse, which had never been thought of, and which the careless St. James had never even observed in the list, rushed past the grand stand in sweeping triumph. The spectators were almost too surprised to cheer; but when the name of the winner was detected there was a deafening shout…” The Dark Horse did not gain recognition in Saratoga Springs until 1913. Racing fans know the year of 1919 was a year that lives in infamy for the great Man o'War. Man o'War was an unstoppable force. The colt was a living legend, with six straight wins in six starts, when he came to Saratoga Springs for the Sanford Stakes. He was a favorite with odds of 11-20. 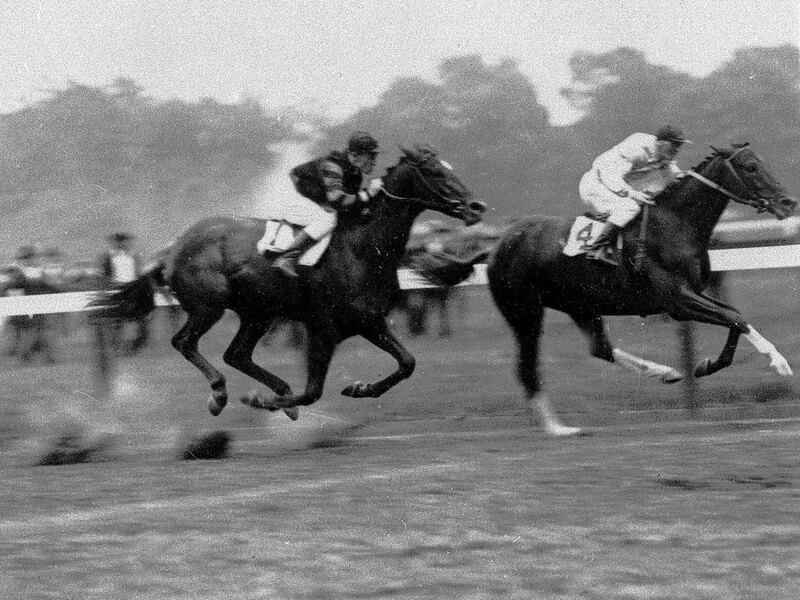 When the tape dropped to start the race Man o'War was backing up and not ready to run. He caught up to the horse in the lead in the final eighth furlong but lost by half a length. The winner was The Dark Horse. A horse named Upset, he is Saratoga's famous Dark Horse. Man o'War ran 21 races total and won 20 of them. Upset became one of the many Dark Horses to defeat favorites at Saratoga Race Course. In 1930 Gallant Fox, the winner of the Triple Crown, came to Saratoga Springs to compete in the Travers Stakes Race. It was supposed to be a close race between The Fox and Whichone but the weather that day did not cooperate and the field was a mud pit. Both favorites road further out from the rail than normal to avoid the mud. Jim Dandy the 100-1 Dark Horse slipped by the two on the rail and defeated Gallant Fox by eight lengths. The Dark Horse once again concurred a champion. It was then that the Saratoga Race Course became known as "The Graveyard of Champions." A name that still haunts favorites today.